With produce prices rising, we’re trying all sorts of things to save money. We learned that we can regrow produce from scraps. It’s an uncomplicated way for us to gain more food for our money. When we use romaine lettuce, we make sure and leave a nice stub at the bottom. Then, we place this stump in a bowl with a little bit of water. It’s important not to use too much water, or we can wind up growing slimy moldy plants instead of delicious food. Just a half-inch or so of water is plenty. After a couple of days, we noticed that roots were beginning to grow out of the bottom of the stump. At that point, we took the plant carefully out of the water and planted it in a pot with soil. We watered it gently when the soil dried out and then cut off new leaves when they were ready to harvest. Like the romaine, we placed the stub of a bunch of celery into a bowl with a little bit of water. We placed this bowl in direct sunlight (a windowsill works well). After about a week, we noticed the leaves thickening and new growth emerging. When this happened, we planted the celery in a pot with soil and continued to water it as needed until it grew tall enough to harvest. We took some potatoes that had eyes on them and carefully peeled them. Once peeled, we cooked the potatoes like normal and examined our peels. Any chunk of peel that had at least two eyes on it was selected for planting. We took these peelings and dried them overnight by leaving them on the counter. The next morning, we carefully placed a couple of peels eye-side-up in a deep pot with soil. It takes time for potato plants to grow and even longer for the potatoes to be ready to eat, but it’s worth the wait. When we tried to regrow an onion, we just cut the bottom of the onion off. This part contains the root. Then, we left the onion bottom on our counter until it was slightly shriveled. After the onion dried a bit, we planted it in a pot with soil with the root side down. We watered our onion well when we planted it and again, as the soil dried. Within a couple of weeks, we had new shoots. 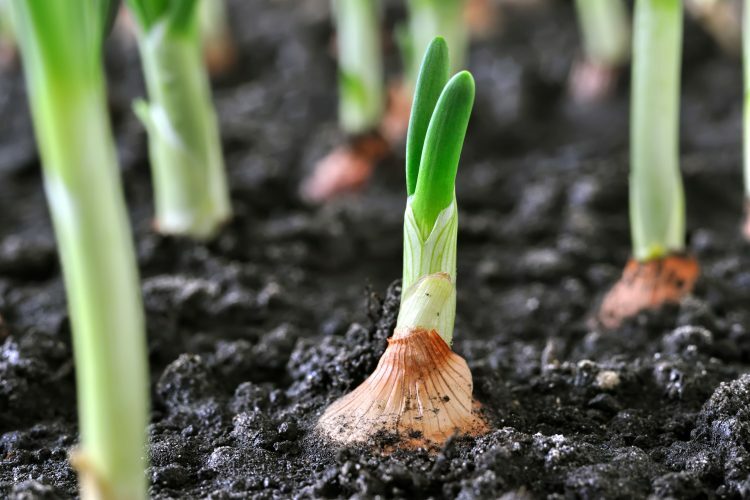 It does take time for the onions to grow under the soil though. We can regrow cabbage without any dirt. We just cut off the root end and placed it in a shallow bowl with a half-inch of water. Every couple of days, we checked to make sure the water hadn’t all evaporated. If needed, we added a bit more. The cabbage plant slowly started growing from the center. Have You Ever Planted Vegetable Scraps? Have you ever tried to regrow vegetable scraps? We’d love to hear about your experiences. Please tell us all about it over on our Facebook page. For more money saving tips, be sure to check out the iRazoo blog frequently.